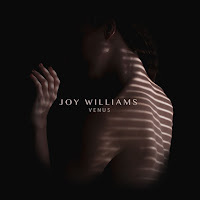 JP's Music Blog: CD Review: Joy Williams Leaves The Civil Wars Behind And Heads For "Venus"
CD Review: Joy Williams Leaves The Civil Wars Behind And Heads For "Venus"
Singer/songwriter Joy Williams just released her latest studio album "Venus" on June 29th through Columbia Records. It is her first solo album since the breakup of The Civil Wars and it showcases a more modern pop flair than her past adventures. Beginning with the dance beats of "Before I Sleep," Williams uses her voice to control the song's meaning by expressing her power during the chorus. She gets a smooth R&B groove flowing through "Sweet Love Of Mine," before heading into the dance/pop gold of the album's lead single "Woman (Oh Mama)." She does not forget her years with The Civil Wars as she gently delivers "One Day I Will" and "What A Good Woman Does" as her voice soars. The highlight of the album is "Until The Levee" as Williams pours all her emotions into her performance of the song's lyrics. The album closes with the gentle touch of "Welcome Home" as you find yourself pressing repeat, in order experience her "Venus" album once again. To find out more about Joy Williams, please visit her website at joywilliams.com.